GOLD: Pressured To The Upside, Eyes The 1,030.85 Level - As a sharp rally through its recent high at the 1,011 level saw Gold maintaining its medium term uptrend triggered off the 781 level, its. GOLD: As a sharp rally through its recent high at the 1,011 level saw Gold maintaining its medium term uptrend triggered off the 781 level, its 2008 low today, pressure has started building on the 1,030.85 level where its all time high is located. 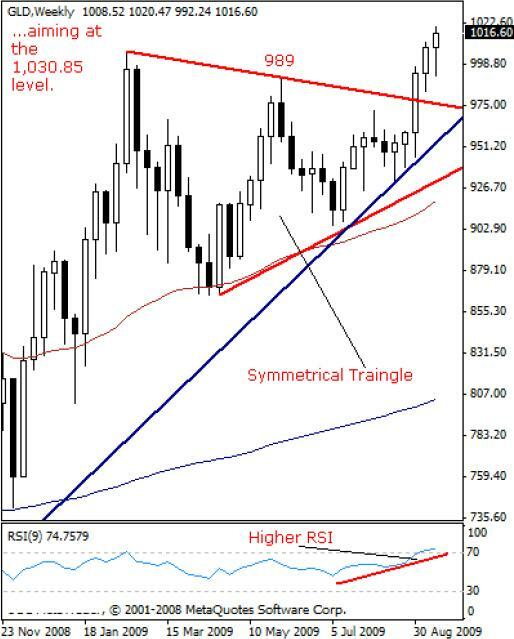 We believe that while the commodity holds above its broken symmetrical triangle as well as its MT rising trendlinedrawn off the 781 level, possibility of a break through the 1,030.85 level and an eventual resumption of its longer term uptrend remains on the cards. If this scenario plays out, we should see a move further higher towards the 1,050 level and the 1,100 level. This view is supported by its weekly RSI which is now bullish and trending higher. On the other hand, if corrective pullbacks are triggered, we could see declines aiming at the 1,011 level where its minor support is located at first followed by the 989 level, its May high and then the 971.60 level, its Aug 08’09 high with a break below there pushing it lower towards its MT rising trendlinecurrently at 931.00 where a cap is expected. On the whole, having continued to strengthen, Gold now has its focus on its longer term uptrend resumption.